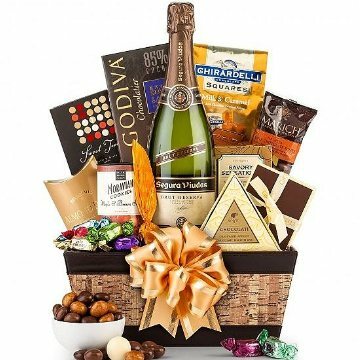 This gift basket includes the following: Aaron Bell Almonds 1.5 oz, Candy Berries 2 oz, Dolcetto Peanut Butter Wafers 3 oz, Godiva 72% Cacao Dark Chocolate Tablet 3.5 oz, Marich Triple Chocolate Toffee 2.3 oz, Almond Roca .82 oz, Champagne Apricot Chocolate Biscotti Bar 1.25 oz, Ghirardelli Milk Chocolate with Caramel Squares 5.32 oz, Lindt White Chocolate Truffles .48 oz each, Segura Viudas Brut Reserva. Segura Viudas Brut Reserva - A clean and delicate cava from the Penedes region of Spain, Segura Viudas is produced with the traditional methode champenoise technique and bottle-aged for up to two years. Crisp cider apples mingle with lychee, toast, and an overarching creaminess in this light celebratory bubbler. Please note that this gift is only available for purchase and receipt by persons over 21 years of age. Under a rare circumstance, we reserve the right to substitute product in this gift for products of equal or greater value.